It was on July 1st 1973 that Bishop Colin MacPherson conducted the Blessing and Dedication of the church to Our Lady, Star of the Sea. It was the first Roman Catholic church on the Island of Mull to be re-established since the Reformation. A small ruin in Tobermory graveyard is believed to be the remains of a chapel of Repose where bodies lay awaiting burial in pre-Reformation times, but no other evidence of a local Catholic community is known even though the gaelic name for Tobermory means “ Well of Mary “ referring to Mary, Mother of Christ. Nearer to the present time, a small chapel was maintained in the original Glenforsa Estate for family use. It was a small corrugated roofed house and was left open for all to use. The family at Glenforsa employed a Jesuit priest as a tutor for their children, but the family left Mull shortly after the war years. From 1948 to the 1973 church opening there were efforts by missionary priests and lay brothers to serve the Catholics on Mull. The Redemptorist priests from Perth were based at Letterwalden, near Benderloch, and they celebrated Mass in the living rooms of the three or four Catholic families they found here. They kitted out a small green van with sleeping bags and toured the island, in their words, “looking for souls “. Their visits ceased in 1955. Priests from the Cathedral in Oban would visit Mull on a monthly basis- Thursday evenings in winter, more frequently in summer. The priest would travel from Oban to Grasspoint on Sunday mornings and was taken back by car to Grasspoint for the afternoon excursion boat to Oban. The altar was set up in the Aros Hall, the Drill Hall, Salen Hall and various living rooms. In 1957 Fr Wynn (now Mgr Wynn) offered his Mull Mass in the Drill Hall, Tobermory and became the chief ally of the small band of Catholics who just wanted a church. Bishop Kenneth Grant agreed to the setting up of a Chapel fund and the generosity of visitors to Mass on Mull was prevailed upon. Up to 1970, several sites were considered and then rejected. In the mean time costs were soaring and the fund grew only slowly. Then, in 1970, Mrs Betsy MacAllister offered a piece of ground and a small chalet behind her house in Victoria St. Tobermory, to the Bishop, for conversion to a Chapel.Then began two years of hard labour as heating, plumbing and furnishing began. The Mass of Blessing and Dedication was con-celebrated by Fr Wynn and the Bishop. The reading was from Ephesians 2 v.19-22. During the winter and spring of 1984, much needed repair and maintenance work was carried out by parishioners Roger Felter and Neil MacInnes; at the same time they made alterations to accommodate extra seating and laid cork tiles on the floor. The numbers of parishioners and visitors have swelled and reduced many times since the 1973 dedication, but hundreds of people have worshipped in this little church, maintained by the priests from Oban, and parishioners who have kept the Faith. To think of a church on Mull, any church, and immediately one thinks of Iona and Columba. Yet he was not the first or the only Christian connected with the Island. St Ninian was before him. However so much has been written of him that visitors and locals think of him as the be all and end all of Christianity in this area. So to begin my search I start with Colum. He was born between 518 and 523, into the reigning families of Ireland. Both his mother and father were of royal blood and, this being so, he was well educated. As a youth he became a pupil of St Finnian, the founder of an ecclesiastical school, around 450 at the head of Strangford Lough. It was here that Columba was made a deacon of the Church. He also studied for a time, Irish literature and rhetoric under another Finnian, St Finnian of Clonard, a Christian bard.. It was during this time that stories of Columba's miracles spread. After this Columba was ordained a priest, founded the monastery of Durrow, the around 561 he blotted his copy book. The battle of Cooldrevney is believed to have been instigated by Columba's behaviour. After that Adomnan, who gives us the story of Columba's life, tells that a synod was assembled to excommunicate Columba. However he was sent instead to convert the Picts. It is here that we must remember that Ninian, who is recorded by Venerable Bede, returned home from Rome via Tours and in doing so absorbed many of the ideas of Martin. Tradition tells us that Ninian carried his mission beyond the Solway with the intention of converting the Picts. We are told he built his church at Whithorn in 397, dedicating it to St Martin. This is the ' Candida casa ' of history. Almost 200 years before Columba was born. Before I return to Columba I must point out that Bede tells us that the Southern Picts, by the teaching of Ninian 'forsake the errors of idolatry ' long before Columba's mission. Ninian was reputed to have taken his mission up the West coast and inland as far as the Great Glen. Wherever he went cannot be proven; what can is that there were Christian converts before Columba. Even St Patrick launched an attack on 'apostate picts ' in early 400. So when Columba and his twelve attendants arrived on our Western seaboard it wasn't all heathens and it was a very different country than it is today. These Islands were not 'a place to escape to' but were the centre of the world. Not thickley populated, but they were able to support balanced communities, growing crops, plying trade and fighting fiercely for their interests in the battles of the Picts and Dalreadans. They weren't the fringe, they were a significant part of the kingdom of Dalriada that covered Ireland and the present area known as Argyll and Bute. These people who lived here were well worth strenuous efforts to bring within the Christian fold. Iona is the latinised name, the Gaelic name was Hy or simply I. With the coming of Columba Iona became the Mother Church of Alba within Dalriada, and Columba became the recognised religious leader of his people. The form of worship practised was that practised throughout Ireland. The preaching of Columba was the word of God as taught by the apostles and evangelists. Celebration of the Eucharist took place during fixed festivals. Columba set out to convert the Druids; no one really knows how he did it. Some say that because he was not so far away from his own Celtic superstitions, he won them over with his 'magic'. The influence of Columba and his brethren began to spread throughout Dalriada, and by the 6th century the Dalriadan Scots were living in comparative peace. After Columba's death the Abbey continued with their teaching, but Rome was beginning to be upset by this Scots church. In 632 the Abbot of Iona was told that the Clergy of Ireland ( the Irish kingdom of Dalriada) has accepted the Roman Easter, but Iona did not follow suit. The Celtic monks continued for many years to trudge vast distances to carry the message of the Gospels as taught by Columba. Even Augustine, whose seat was Canterbury, admired them. However, the Synod of Whitby called in 664 was the beginning of the end of what was the Columban Church. Eventually Iona conformed to the Roman Easter and the Roman tonsure, but continued to venerate Columba rather than Peter. All these things we know because they were written down by Adomnan and Bede. Adomnan wrote about the numerous visits of Columba and his Companions but to trace these places is like some large jig-saw without the picture. Even then the pieces do not always fit. What we do know is that the area was dominated by Iona, so many of the dedications of Chapels and burial grounds, to say nothing of the stones, wells and streams, were to Columba or other Irish Saints associated with him. These notes give a little of what is known of the beginning of Christianity on Mull. 'Kil' as a prefix indicates an ecclesiastical site named or in use before the Norse invasion and as the Vikings came in the early 9th century, so the 'Kils' of Mull date back to Columba or earlier. It is known that there were seven medieval churches on Mull in the early 15th century annexed to the Abbey of Iona. Before talking of the churches I would like to tell you of other sites connected to early Christianity. As we begin with Iona so I will start on the Ross. Near to Kilvickeon chapel, on the rocky shore is Scoor Cave. Here on the walls are many small markings. There are Latin and Greek crosses similar to those found in the Nun's Cave, Carsaig, further to the East along the coast. The RCAMS suggest that these may have been made by people who occupied the cave in early Christian times. The Nun's Cave has the Gaelic name of 'Uamh nan Cailleach'; 'the cave of the women'. There is also a pass nearby to the top of the cliffs jnown as the Nun's Pass. In a field at Killunaig is a burial ground. Nothing is left of the early Church or grave stones, but this site bears the same name as the church of Killunaig on Coll, both probably dedicated to St Findora of Coll. Into Loch na Keal - 'the Loch of the Cells'. Many of the very old burial grounds are now no more than circulare shapes on the ground, showing a different green in spring, but local folk will tell you they are there, and "no one ever ploughs that field". There is just such a one at Balmeanach, Gribun. No one knows the name but no one touches it. Further along at Knock is another unnamed burial ground, the earliest monument dated 1745, but in Glen Cannel is a different story. At the entrance to the Glen is a 19th century sheepfold and you will be told that the stones used to make it were taken from the houses and the burial ground. It has no name but to prove a point the remains of the old burial ground appear as stony mounds, and by looking carefully you can find grave markers in the ground and also as part of the walling. Killmore on the way to Ulva Ferry. It could mean 'Coille mor', the big wood, it could also mean the 'Big Cell or Chruch'. Amongst the ruins here are the Bishop's garden, 'Garadh an Easbuig' the Chapel and the Font stone, all well known names passed down through the generations. There is a reputed burial groundat Achronnich, at the foot of the cliff, and below on the shore at Port a' Chlaidh - 'Port of the Cemetery' is a well defined burial ground. This could well be a church that was dedicated to St Martin. There are grave markers and slate grave stones, one at least dated, all within a roughly circular enclosure. Kilbrennan named after St Brennan is just another curved bank of turf with marking stones, but again no one ever ploughs that field, it is known locally for what it is, consecrated ground. Cragaig, Cillchriosd, Loarin Bay, Lephin, Kildavie (Cell of David?) and Lag na Cille, Garmony are just a few known places on Mull which have fragmentary enclosures, some marker stones but nothing else, just the knowledge handed down from generation to generation. There are also the wells Tobar Choluim Chille - 'St Columba's Well' in Glen Byre. This name is given to a fresh water spring which is said to have medicinal qualities. In Glen More is 'Tobar Leac ant Sagairt' - 'The Priest's Well'. The story goes that Killean became vacant and being a very desirable charge, Columba would not choose between two applicants. Instead he gave the vacancy to the first of them to reach it. The leading priest flung himself down to drink after the long pull up the Glen, and either over indulged himself with the cold water or was eliminated by the overtaking priest on realising his advantage. At this time there were 7 medieval churches on Mull all annexed to Iona, and of course these churches would all have had minor cells attached to them. In November 1421 there is a mention of Kilvickeuen... "Donald of Yle, Lord of the Isles and Earldom of Ross, on behalf if this his chaplain and familiar Adan Dominici, Vicar of the Parish Church of Kilvickeuen for dispensation to hold further benefice"... And again thatsame year in December he asked for the extension of the benefice... "requested for life". Donald Lord of the Isles also requested that 3 perpetual vicarages, one in Tiree, the others in Kilfinichen and Kilcolmkill in Mull, to be united to the monastery of Iona. One must remember that there is nothing new in the world. The Abbots often "requested, put forward or demanded that their own sons were their successors". In fact many bishops wished to marry their concubines. A great many bishopes, as was Columba, were members of reigning families and so wished their sons to be both legal and to inherit the bishoprics. The successor of Roderick MacLean was one Alexander Gordon who was a friend of John Knox and a protestant sympathiser, this fact alone may have eased the reformation into Iona itself. The Campbells had become very influential in Argyll, one Earl of Argyll and his son signed The First Band of the Protestant Lords in 1557, their aim being to establish the reformed faith in Scotland. They were triumphant, and in the revolution of 1559-1560 Papal Authority was abolished in Scotland, and the Reformed Church was established. In 1625 during the reign of Charles I the Lowland Calvinists revolted against the High Church policies of the King... and the Covenantors were formed, with Campbell, Earl of Argyll as leader. As the Campbells were the most powerful and disliked clan throughout the Islands and Highlands, the folk of the islands had a motive of their own for supporting the king. And if they were Catholics or Episcopalians threatened by Calvinists, that made a double motive. Fear of the Campbells was deep within the folk of Mull, so they must have hoped for a Royal Victory, and yet even at this time families were divided. There were still Catholic missionary priests travelling through Mull and adjacent Isles converting some to the Church of Rome. The MacLaines of Lochbuie became Catholic while Maclean of Duart remained Episcopalian. There is a story about Fr Cornelius Ward, a missionary priest who visited Eigg in 1625. He was the first priest to call since the reformation, and the folk of Eigg had been recieving instructions from a protestant minister. However Fr Ward soon reconciled the 200 folk of Eigg to the Catholic faith. Meanwhile the Rev. McKinnon got to hear of this and out he came with soldiers, but Eigg folk being sensible persuaded Rev. McKinnon by foul means or fair to return to Skye and leave them in peace. MacDonald or Clanranald who owned Eigg heard of the fracas and bought off the minister by offering him tithes on Eigg if he would leave the folk in peace. It worked. Hector MacLean of Duart though surrounded by Catholics, and opposed to the religion of Rome remained an Episopalian. However as soon as he died, his son Lachlan was threatened again by the Campbells, that unless he joined the Covenanters, they, the Campbells, would ruin him. True to his word Campbell Argyll did eventually ruin Maclean of Duart and in 1659 MacLean lost all the lands he possessed. In 1674 Campbell or Argyll invaded Mull with 2,000 men. It was at this period in time that John Beaton the senior representative of the Pennycross medical family, was the Episcopal minister in Kilninian. One would have thought him safe from waring factors. He was not, and when Calvinism triumphed in 1688 Beaton left Kilninian destitute. He went to Ireland taking with him his library of medical manuscripts. There has to be a jump of 100 years now because so little is written about the religious activities on Mull. With that jump we come nearer to the Mull we know. In 1771 Dr John Walker visited the Island. He found that it was already divided into the 3 large parishes we know today. Kilfinichen and Kilvickeuen, Kilninian and Kilmore and Torosay. He tells us that, "Ross which contains Kilfinichen and Kilvickeuen has four places of worship; Kilfinichen, Bunessan, Torrin and Icolumkil". He also says that there are no churches or manses in any place. Torosay had three places of worship; Pennygown, Torosay and Kinlochspelve, again with no churches or manses. In 1790, July 16th, T.T.Garnet noted his visit to the Rev Alexander Frazer, minister of the parish of Torosay. He passed through the village of Killean, consisting of 20 - 30 miserable huts. Mr Frazer resided a very short distance from this village, in a dwelling by no means suitable to the situation of a minister. Mr Frazer said he had entered a plea for manse and a glebe, unsuccessfully. 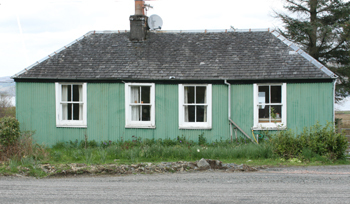 The Minister officiated at Kilninian and Kilmore (Dervaig), Aros and Ulva but neither had a manse or a glebe. This is the only parish where we are not told there is no church, yet it does not mention one in writing. Local tradition does have it that there has always been a church of 'some kind' at Kilninian. At the time of Dr. Walker's visit there were 5,325 people on Mull. There were 10 people registered as Papists, and those not of native stock CATHOLICISM HAD GONE. It continues in this vein. The statistical accounts were written by the indigenous ministers of the isle and they give us the following information. Kilfinichen and Kilvickeuen had a population of 3,002 but no one of the papist religion in the parish. Kilninian and Kilmore were mentioned as having the ruins of 7 of 8 edifices that had probably been chapels in the time of Popery. There were two churches built within the parish in 1745. One at Kilninian and one at Torosay (Craignure). The minister however had to travel around the parish, and complained about his pay! (What's new?) He received £25 sterling with no accommodation. Mrs Sarah Murray of Kensington on her journey through Mull in 1803 said, "I saw one kirk on the banks of the Island of Mull in the parish of Torosay, I believe there is one in Kilninian, but not one covered appropriate place is there in the extensive parish of Ross, for a minister of Christ's gospel to preach in - even Iona does not afford a better shelter than a barn for the perfomance of divine service..."
Mrs Murray also mentions that she was to attend a wedding in Bunessan. However the young couple, who were making their way around the head of Loch Scridan, met up with the missionary and begged him to marry them immediately to save them the long journey to Bunessan. As she writes the wedding took place on the shores of the loch with a local witness. This account saw little change in Ross where the population had risen to 4,102 but no papists at all. There were however two new churches, one at Bunessan and one at Kilfinichen, though services were still held at Torrans. Kilvickeuen on Ulva was stated by Rev D. MacArthur the parish minister, as having been a place of worship during the dominance of the Roman Church. A Rev Duncan Clerk, minister in Torosay mentions the ruins of Killean (below Gualachullish) and Lagan (Lochbuie) as being used before the reformation.